I somewhat recently discovered the joys of shopping at Trader Joe's; I love their unique products, affordable prices, and cheerful employees. I picked up a bag of frozen cauliflower rice a couple of weeks ago, and was excited to try it out. I held out on the vegetables-instead-of-carbs trend for quite a while, but decided to take the plunge. I've owned a spiralizer for years but just recently jumped on the zucchini noodle bandwagon (except I refuse to call them zoodles), and thought maybe I could get behind the cauliflower rice trend. The verdict? I like it! It's got a nice bite, similar to rice, and it's super versatile just like traditional rice. 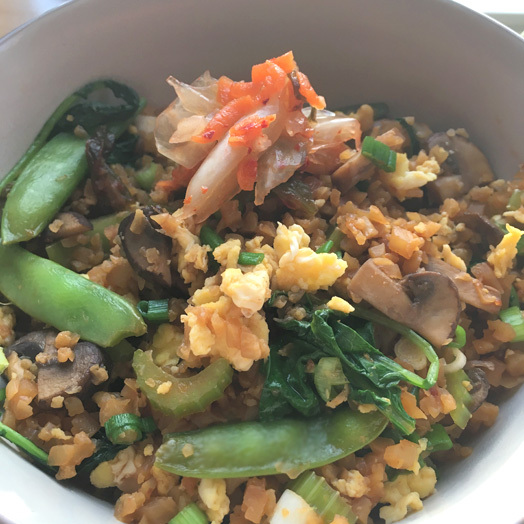 I'll have to spend some time developing more recipes, but this fried cauliflower rice made a great dinner. Augmented with cremini mushrooms, sugar snap peas, and more, it was a delicious and healthy meal that I'm certain to make again. Combine the ingredients for the sauce together in a small bowl and stir well. Heat a medium skillet over medium heat with 1/2 t. canola oil. When pan is hot, scramble the egg to desired doneness. Transfer the egg to a bowl and set aside. Add remaining 1/2 t. oil to the skillet (if you're not using a non-stick skillet, you may need to give it a quick scrub). Add mushrooms and saute until they've shrunk and started to turn golden brown. Add sugar snap peas, celery, and cauliflower rice and saute for 3-5 minutes until cauliflower is thoroughly heated and most moisture has evaporated. Turn the heat to medium-high and add the sauce. Continue cooking until the sauce is almost fully evaporated. Add in the baby kale and scallions, and turn off the heat. Toss thoroughly and let the residual heat wilt the kale. Stir in the scrambled egg and serve immediately, topped with the kimchi if desired.